Cordova High School's Kyle Allen and Briarwood Christian's Nikki Sullivan were named outstanding male and female students at this year's Alabama Governor's School. 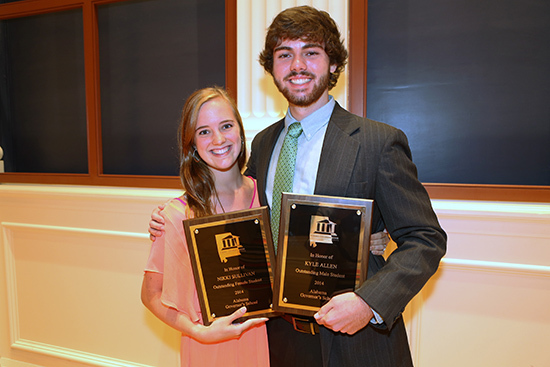 They received their awards at the closing session of the Samford University-sponsored program Friday, June 27. Allen and Sullivan were chosen by AGS students, faculty and staff on the basis of their participation and overall interest in the two-week honors program for rising high school seniors. This year's 91 students from high schools in 24 Alabama counties represented the largest number of participants in the history of AGS, which began at Samford in 1987. Allen is the son of Lisa and Kenny Allen. Sullivan is the daughter of Joanie and Ralph Sullivan. AGS participants received college level experience in academic subjects, creative activities and leadership opportunities. They participated in a service project in Woodlawn, visited American Village in Montevallo, attended a Birmingham Barons baseball game and heard special lectures on servant leadership and issues that relate to human rights violations worldwide. In the classroom, they chose from 16 course topics to study in morning and afternoon sessions. AGS director and Samford biology professor George Keller noted that this year's participants seemed particularly keen on absorbing all aspects of the program. "These students took full advantage of the opportunities provided to them, and reported that their lives were changed because of the experience," Keller said.